Up is a 2009 American 3D computer-animated comedy-drama buddy adventure film produced by Pixar Animation Studios and released by Walt Disney Pictures. The film centers on an elderly widower named Carl Fredricksen (Ed Asner) and an earnest boy named Russell (Jordan Nagai). By tying thousands of balloons to his house, Carl sets out to fulfill his dream to see the wilds of South America and complete a promise made to his late wife, Ellie. The film was directed by Pete Docter and co-directed by Bob Peterson, who also wrote the film's screenplay, as well as the story with Tom McCarthy, with music composed by Michael Giacchino. Docter began working on the story in 2004, which was based on fantasies of escaping from life when it becomes too irritating. He and eleven other Pixar artists spent three days in Venezuela gathering research and inspiration. The designs of the characters were caricatured and stylized considerably, and animators were challenged with creating realistic cloth. Up was Pixar's first film to be presented in Disney Digital 3-D. It was released on May 29, 2009, and opened the 2009 Cannes Film Festival, becoming the first animated and 3D film to do so. The film grossed over $735 million, and received universal acclaim, with critics commending the humor and heart of the film. Asner's vocal performance was praised, as was the montage of Carl and his wife Ellie aging together. The film received five Academy Award nominations, including Best Picture, making it the second animated film in history to receive such a nomination, following Beauty and the Beast (1991). In the 1930s, shy eight-year-old Carl Fredricksen idolizes famous explorer Charles F. Muntz. When Muntz is accused of fabricating the skeleton of a giant exotic bird he says he discovered at Paradise Falls, he vows not to return until he captures one alive. One day, Carl befriends a girl named Ellie, also a Muntz fan. She confides to Carl her desire to move her "clubhouse"—an abandoned house in the neighborhood—to a cliff overlooking Paradise Falls. Carl and Ellie grow up, marry and live in the restored house. After Ellie suffers a miscarriage and they are told they cannot have a child, the couple remembers their childhood dream of visiting Paradise Falls. They save for the trip, but repeatedly have to spend the money on more pressing needs. Finally, the now elderly Carl arranges for the trip but Ellie suddenly falls ill, is hospitalized, and dies. Years later in the present day, Carl still lives in the house by stubbornly holding out while the neighborhood homes are torn down and replaced by skyscrapers. When he accidentally injures a construction worker, the court deems him a public menace and orders him to move to a retirement home. However, Carl resolves to keep his promise to Ellie by turning his house into a makeshift airship using thousands of helium balloons. Russell, a young "Wilderness Explorer" who visits Carl in his effort to earn his final merit badge for assisting the elderly, becomes an accidental stowaway. The flying house encounters a nimbus storm and ends up high above South America. The house lands on a tepui opposite Paradise Falls. Carl and Russell harness themselves to the still-buoyant house and begin to walk it across the mesa, hoping to reach the falls before the balloons deflate. Russell encounters a tall, colorful flightless bird whom he names "Kevin". They then meet a Golden Retriever named Dug, who wears a special collar that allows him to speak and who vows to take the bird to his master. The next day, they encounter a pack of aggressive dogs led by Alpha, a Doberman Pinscher, and are taken to their master, who turns out to be Charles Muntz. Muntz invites Carl and Russell aboard his dirigible, where he explains to them that he is still searching for the giant bird he promised to bring back. When Russell notes the bird's similarity to Kevin, Muntz becomes hostile, believing they are attempting to capture the bird themselves. Carl flees with Kevin and Dug, but Muntz captures Kevin and starts a fire beneath Carl's house, forcing him to choose between saving it or Kevin. Carl saves the house and eventually reaches the falls, but Russell is upset at Carl for abandoning Kevin. Carl looks through Ellie's childhood scrapbook and is surprised to find that she has filled in the blank pages with photos of their marriage, along with a note written from her hospital bed, thanking him for the "adventure" and encouraging him to have a new one. The repentant Carl goes outside, only to see Russell sailing off with some balloons and a propulsive leaf blower to rescue Kevin. By throwing out his furniture and keepsakes, Carl lightens the house enough to follow. Russell is captured by Muntz, but Carl manages to board the dirigible, tether the house, and free Russell and Kevin. Dug saddles Alpha with the cone of shame and thereby unexpectedly becomes the dogs' new leader. Muntz determinedly pursues them around the airship and manages to disable Carl's house, but snags his foot on some loose balloon lines and falls to his death. The house, having lost too many balloons to fly, descends out of sight through the clouds. Carl and Russell reunite Kevin with her chicks and fly the dirigible back home. Russell receives his 'Assisting the Elderly' badge, and Carl presents Russell with his own badge: a grape soda cap that Ellie gave to Carl when they first met. Meanwhile, unknown to Carl, his house has landed on the cliff beside Paradise Falls, fulfilling his promise to Ellie. Ed Asner as Carl Fredricksen: Docter and Rivera noted Asner's television alter ego, Lou Grant, had been helpful in writing for Carl because it guided them in balancing likable and unlikable aspects of the curmudgeonly character. When they met Asner and presented him with a model of his character, he joked, "I don't look anything like that." (The appearance of Carl is meant to resemble Spencer Tracy as he appeared in his final film, Guess Who's Coming to Dinner.) They tailored his dialogue for him, with short sentences and more consonants, which "cemented the notion that Carl, post-Ellie, is a disgruntled bear that's been poked awake during hibernation". In Colombia, unexpected publicity for the film was generated due to the uncanny similarity of Carl with Colombian ex-president Julio César Turbay Ayala. Christopher Plummer as Charles F. Muntz: The name of his airship, the Spirit of Adventure, may have been inspired by Charles Lindbergh's airplane, Spirit of St. Louis. In various interviews, Pete Docter has mentioned Howard Hughes and real-life adventurers Charles Lindbergh and Percy Fawcett as inspirations for Muntz. Jordan Nagai as Russell: Throughout most of the film, he makes several comments to Carl that suggest that Russell's father and mother are no longer together. Russell's design was based on Pixar animator Peter Sohn. Docter auditioned 400 boys in a nationwide casting call for the part. Nagai, who is Japanese American, showed up to an audition with his brother, who was actually the one auditioning. Docter realized Nagai behaved and spoke non-stop like Russell and chose him for the part. Nagai was eight years old when cast. Docter encouraged Nagai to act physically as well as vocally when recording the role, lifting him upside down and tickling him for the scene where Russell encounters Kevin. Asian Americans have positively noted Pixar's first casting of an Asian lead character,[not in citation given] in contrast to the common practice of casting non-Asians in Asian parts. Bob Peterson as Dug, the Golden Retriever misfit of Muntz's pack of dogs that can all communicate with humans through a device on each of their collars. Peterson knew he would voice Dug when he wrote his line "I have just met you, and I love you," which was based on what a child told him when he was a camp counselor in the 1980s. The DVD release of the film features a short called Dug's Special Mission, which follows Dug just before his first meeting with Carl and Russell. Dug previously appeared in Ratatouille as a shadow on a wall that barks at Remy. Peterson also voiced Alpha, the Doberman Pinscher leader. Pete Docter has stated that Alpha "thinks of himself as Clint Eastwood". Despite his menacing appearance, a frequent malfunction in Alpha's translating collar causes his voice to sound comically high-pitched and squeaky, as if he had been breathing helium. The normal voice for his translator is a resonant, intimidating bass. With both voices, Alpha has a roundabout speech pattern that causes his sentences to be longer than necessary. Pete Docter as Kevin, the "Beast of Paradise Falls". Docter also voiced Campmaster Strauch, Russell's scout leader, seen at the end of the film. Elizabeth Docter as Ellie: The voice actor is the director's daughter, who also provided some of the drawings shown by Ellie. Elizabeth only voiced Ellie as a child, as adult Ellie had no speaking lines. Jerome Ranft as Gamma, a Bulldog and one of Muntz's dogs. Don Fullilove and Jess Harnell as George and A.J., two nurses who work at Shady Oaks Retirement Village. Director Pete Docter began writing Up in 2004. He developed the fantasy of a flying house on the idea of escaping from life when it becomes too irritating, which stemmed from his difficulty with social situations growing up. Actor and writer Tom McCarthy aided Docter and Bob Peterson in shaping the story for about three months. Docter selected an old man for the main character after drawing a picture of a grumpy old man with smiling balloons. The two men thought an old man was a good idea for a protagonist because they felt their experiences and the way they affect their view of the world was a rich source of humor. Docter was not concerned with an elderly protagonist, stating children would relate to Carl the way they relate to their grandparents. Early concepts differed from the final film. The initial version featured a floating city on an alien planet, with two brothers vying to inherit their father's kingdom, and when the brothers fell to Earth, they encountered a tall bird who helped them understand each other. Docter's next idea introduced many of the elements that eventually made their way into the film, but had Carl and Russell landing the house on a Soviet-era spy airship camouflaged as a giant cloud rather than on a tepui. This concept was rewritten due to its similarity to another idea Pixar was developing. Another idea Docter added, then removed, was magic fountain-of-youth eggs laid by the bird, in order to explain the age discrepancy between Muntz and Carl, but they decided this subplot was too distracting, and people would forgive the minor inconsistency. Docter noted the film reflects his friendships with Disney veterans Frank Thomas, Ollie Johnston, and Joe Grant (who all died before the film's release and thus the film was dedicated to them). Grant gave the script his approval as well as some advice before his death in 2005. Docter recalled Grant would remind him the audience needed an "emotional bedrock" because of how wacky the adventure would become; here it is Carl mourning for his wife. Docter felt Grant's personality influenced Carl's deceased wife Ellie more than the grouchy main character, and Carl was primarily based on Spencer Tracy, Walter Matthau, James Whitmore, and their own grandparents, because there was "something sweet about these grumpy old guys". Docter and Jonas Rivera noted Carl's charming nature in spite of his grumpiness derives from the elderly "hav[ing] this charm and almost this 'old man license' to say things that other people couldn't get away with ... It's like how we would go to eat with Joe Grant and he would call the waitresses 'honey'. I wish I could call a waitress 'honey'." Docter revealed the filmmakers' first story outline had Carl "just want[ing] to join his wife up in the sky. It was almost a kind of strange suicide mission or something. And obviously that's [a problem]. Once he gets airborne, then what? So we had to have some goal for him to achieve that he had not yet gotten." As a result, they added the plot of going to South America. The location was chosen due to both Docter's love of tropical locations, but also in wanting a location Carl could be stuck with a kid due to the inability to leave him with an authority such as a police officer or social worker. They implemented a child character as a way to help Carl stop being "stuck in his ways". Docter created Dug as he felt it would be refreshing to show what a dog thinks, rather than what people assume it thinks. Knowledge of canine communication, body language and pack behaviors for the artists and animators to portray such thoughts came from consultant Dr. Ian Dunbar, veterinarian, dog behaviorist, and trainer. The idea for Alpha's voice derived from thinking about what would happen if someone broke a record player and it always played at a high pitch. Russell was added to the story at a later date than Dug and Kevin; his presence, as well as the construction workers, helped to make the story feel less "episodic". Carl's relationship with Russell reflects how "he's not really ready for the whirlwind that a kid is, as few of us are". Docter added he saw Up as a "coming of age" tale and an "unfinished love story", with Carl still dealing with the loss of his wife. He cited inspiration from Casablanca and A Christmas Carol, which are both "resurrection" stories about men who lose something, and regain purpose during their journey. Docter and Rivera cited inspirations from the Muppets, Hayao Miyazaki, Dumbo, and Peter Pan. They also saw parallels to The Wizard of Oz and tried to make Up not feel too similar. There is a scene where Carl and Russell haul the floating house through the jungle. A Pixar employee compared the scene to Fitzcarraldo, and Docter watched that film and The Mission for further inspiration. The character Charles Muntz comes from Howard Hughes and Errol Flynn. 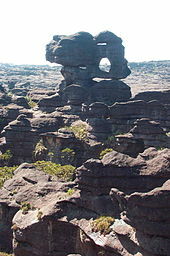 Docter made Venezuela the film's setting after Ralph Eggleston gave him a video of the tepui mountains of Canaima National Park; tepuis were previously featured in another Disney film, Dinosaur. In 2004, Docter and eleven other Pixar artists spent three days reaching Monte Roraima by airplane, by jeep, and by helicopter. They also spent three nights there painting and sketching, and encountering ants, mosquitoes, scorpions, frogs, and snakes. They then flew to Matawi Tepui and climbed to Angel Falls. Docter felt "we couldn't use [the rocks and plants we saw]. Reality is so far out, if we put it in the movie you wouldn't believe it." The film's creatures were also challenging to design because they had to fit in the surreal environment of the tepuis, but also they had to be realistic because those mountains exist in real life. The filmmakers then visited the Sacramento Zoo to observe a Himalayan monal for Kevin's animation. The animators designed Russell as an Asian-American, and modeled Russell after similar looking Peter Sohn, a Pixar storyboarder who voiced Emile in Ratatouille and directed the short Partly Cloudy, because of his energetic nature. While Pixar usually designs their characters to be caricatured, Carl was even more so, being only at least three heads high. He was not given elderly features such as liver spots or hair in his ears to keep him appealing, yet giving him wrinkles, pockmarks on his nose, a hearing aid, and a cane to make him appear elderly. Docter wanted to push a stylized feel, particularly the way Carl's head is proportioned: he has a squarish appearance to symbolize his containment within his house, while Russell is rounded like a balloon. The challenge on Up was making these stylized characters feel natural, although Docter remarked the effect came across better than animating the realistic humans from Toy Story, who suffered from the "uncanny valley". Cartoonists Al Hirschfeld, Hank Ketcham, and George Booth influenced the human designs. Simulating realistic cloth on caricatured humans was harder than creating the 10,000 balloons flying the house. New programs were made to simulate the cloth and for Kevin's iridescent feathers. To animate old people, Pixar animators would study their own parents or grandparents and also watched footage of the Senior Olympics. The directors had various rules for Carl's movements: he could not turn his head more than 15–20 degrees without turning his torso as well, nor could he raise his arms high. However, they also wanted him to grow more flexible near the end of the film, transforming into an "action hero". A technical director worked out that to make Carl's house fly, he would require 23 million balloons, but Docter realized that number made the balloons look like small dots. Instead, the balloons created were made to be twice Carl's size. There are 10,927 balloons for shots of the house just flying, 20,622 balloons for the lift-off sequence, and a varying number in other scenes. Up is the third Pixar film to be scored by Michael Giacchino, after The Incredibles and Ratatouille. What Pete Docter wanted most importantly out of the music was the emotion, so Giacchino wrote a character theme-based score that producer Jonas Rivera thought enhanced the story. At the beginning of the movie, when young Carl is in the movie theater watching a newsreel about Muntz, the first piece of music heard is "Muntz's Theme", which starts out as a celebratory theme, and echoes through the film when Muntz reappears 70 years later. "Ellie's Theme" is first heard when she is introduced as a little kid and plays several times during the film in different versions; for instance, during the sequence where Carl lifts his house with the balloons, the theme is changed from a simple piano melody to a full orchestral arrangement. Giacchino has compared the film to opera since each character has a unique theme that changes during a particular moment in the story. The score was released as a digital download on May 26, 2009, three days before the film opened in theaters. It won the Academy Award for Best Original Score, the Grammy Award for Best Score Soundtrack Album, the Golden Globe Award for Best Original Score, and the 2010 BAFTA Award for Best Film Music. It is the first score for a Pixar film to win the Oscar (Randy Newman also won for Monsters, Inc. and Toy Story 3, but in the category of Best Original Song). George Lucas with the film's protagonists at the 66th Venice International Film Festival in September 2009. When the film screened at the El Capitan Theatre in Hollywood, California from May 29 to July 23, 2009, it was accompanied by Lighten Up!, a live show featuring Disney characters. Other tie-ins included children's books such as My Name is Dug, illustrated by screenwriter Ronnie del Carmen. Despite Pixar's track record, Target Corporation and Walmart stocked few Up items, while Pixar's regular collaborator Thinkway Toys did not produce merchandise, claiming its story is unusual and would be hard to promote. Disney acknowledged not every Pixar film would have to become a franchise. Promotional partners include Aflac, NASCAR, and Airship Ventures, while Cluster Balloons promoted the film with a replica of Carl's couch lifted by hot air balloons for journalists to sit in. Prior to the film's worldwide release date, Pixar granted a wish from ten-year-old Colby Curtin to see the film before she died. Colby had a rare form of vascular cancer and was too sick to go to a theater. A Pixar employee flew to the Curtins' house with a DVD of the finished film and screened it for her and her family. Curtin died seven hours later at 9:20 pm, shortly after seeing the film. Basically, the message of the film is that the real adventure of life is the relationship we have with other people, and it's so easy to lose sight of the things we have and the people that are around us until they are gone. More often than not, I don't really realize how lucky I was to have known someone until they're either moved or passed away. So, if you can kind of wake up a little bit and go, "Wow, I've got some really cool stuff around me every day", then that's what the movie's about. Before its theatrical release, Disney·Pixar created three small animated vignettes called UPisodes to promote Up on the internet. These UPisodes chronicled Carl Fredricksen and Russell's journey through the jungle, not seen in the movie. Fans were able to view the vignettes on Apple iTunes movie trailer site and YouTube. UPisode One: Animal Calls – in the first episode, Russell demonstrates his ability to mimic animal calls. UPisode Two: First Aid – in the second episode, Russell tries to relieve a minor injury that Carl received. UPisode Three: Snipe Trap – in the third episode, Russell attempts to capture the elusive snipe. 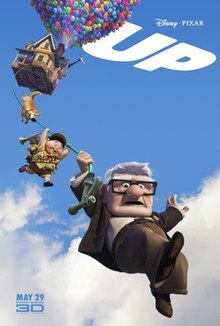 Up was released on Blu-ray Disc and DVD in North America on November 10, 2009, and in the United Kingdom on February 15, 2010. It features the film plus the theatrical short Partly Cloudy and the new short Dug's Special Mission, as well as an audio commentary by director Pete Docter, Adventure is Out There a documentary about the filmmakers' research journey to South America, The Many Endings of Muntz (an alternate ending of sorts), and a digital copy. The Blu-ray edition has a four-disc pack that adds Cine-Explore with BonusView, Global Guardian Badge and Geography games, eight documentaries, and BD-Live to the Deluxe DVD and digital copy platters. A Limited Edition, known as the Luxo Jr. Premium Pack, includes a collectible lamp modeled after Pixar's bouncy short star that is designed to hold a complete Pixar Blu-ray collection. In addition, Pixar also created a short film titled George & A.J., written and directed by storyboard artist Josh Cooley. This shows what the two Shady Oaks retirement home workers did after Carl left with his house. It was initially available for purchase at the iTunes Store and then was later posted to Disney·Pixar's Facebook and YouTube pages. In its first week, it sold 3,969,792 units ($66,057,339) and eventually reached 10,811,453 units ($182,591,149), becoming the best-selling DVD among those released in 2009 in units sold. It also became the third in sales revenue behind Transformers: Revenge of the Fallen, and Twilight. The rental release of the film to Netflix, Blockbuster, and Redbox was controversial since it failed to include closed captioning. Disney faced a consumer backlash over this and quickly released a statement that this removal was an unfortunate error and that it was moving to correct the issue. Up earned $293 million in the United States and Canada and $442.1 million in other countries for a worldwide total of $735.1 million. Worldwide, it was the sixth-highest-grossing film of 2009, the fourth-highest-grossing Pixar film, the 55th-highest-grossing film, and the 15th-highest-grossing animated film. In the United States and Canada, Up is the 59th-highest-grossing film before inflation, the tenth-highest-grossing Disney film, the seventh-highest-grossing 3-D film, the sixth-highest-grossing animated film, the fifth-highest-grossing film of 2009, and the fourth-highest-grossing Pixar film. On its opening weekend, it performed stronger than analysts had been expecting, ranking number one with $68,108,790. This is the fourth-highest-grossing opening for Pixar and the third-largest post-Memorial Day opening. It set a record for opening-weekend grosses originating from 3-D showings with $35.4 million (first surpassed by Avatar). The opening-weekend audience was 53% female and 47% under 17 years old. The film experienced small drop-offs on subsequent weekends, but lost first place to The Hangover. Outside the US and Canada, it is the 43rd-highest-grossing film, the tenth-highest-grossing animated film, the fifth-highest-grossing film of 2009, and the third-highest-grossing Pixar film. It was on top of the overseas box office for three consecutive weekends and for four in total. Its highest-grossing opening weekends were recorded in France and the Maghreb region ($8.88 million); the UK, Ireland and Malta ($8.44 million), and Japan ($7.24 million). These three were also its highest-grossing countries in total earnings. Among major countries, it was the highest-grossing animated film of 2009 only in Spain ($37.1 million), Australia ($25.3 million), and South Korea ($6.32 million). On review aggregator website Rotten Tomatoes, the film has an approval rating of 98% based on 290 reviews, with an average rating of 8.7/10. The site's critical consensus reads, "An exciting, funny, and poignant adventure, Up offers an impeccably crafted story told with wit and arranged with depth, as well as yet another visual Pixar treat." On Metacritic the film has a weighted average score of 88 out of 100, based on 37 critics, indicating "universal acclaim". Audiences polled by CinemaScore gave the film an "A+" on an A+ to F scale, one of fewer than 80 films to earn the score in the history of the service. Film critic Roger Ebert gave the film four out of four stars and called it "a wonderful film." The Hollywood Reporter lauded the film as "Winsome, touching and arguably the funniest Pixar effort ever, this gorgeously rendered, high-flying adventure is a tidy 90-minute distillation of all the signature touches that came before it." Although the San Francisco Chronicle noted that the film "contains many boring stretches of mindless freneticism and bland character interaction," it also declared that there are scenes in Up of "such beauty, economy and poetic wisdom that they belong in any anthology of great movie moments ... to watch Up with any attention is to be moved and astonished by the economy with which specific visuals are invested with emotion throughout [the film]. ... " Variety enthused that "Up is an exceptionally refined picture; unlike so many animated films, it's not all about sensory bombardment and volume ... Unsurprisingly, no one puts a foot wrong here. Vocal performances ... exude a warm enthusiasm, and tech specifications could not be better. Michel Giacchino's full-bodied, traditional score is superlative ..." The Globe and Mail stated that Up is "the kind of movie that leaves you asking 'How do people come up with this stuff?'" along with an overall positive review on the film, despite it being predictable. The character of Carl Fredricksen has received mostly positive reception. Bill Capodagli, author of Innovate the Pixar Way, praised Carl for his ability to be a jerk and likable at the same time. Wall Street Journal editor Joe Morgenstern described Carl as gruff, comparing him to Buster Keaton, but adds that this begins to wear thin as the movie progresses. He has been compared with Spencer Tracy, an influence on the character, by The Washington Post editor Ann Hornaday and Empire Online editor Ian Freer, who describes him as similar to a "Guess Who's Coming to Dinner-era" Tracy.Entertainment Weekly editor Lisa Schwarzbaum described his appearance as a cross between Tracy and an eccentric out of a George Booth cartoon. TIME editor Richard Corliss also makes the comparison, calling him a "trash compacted version" of Tracy. He has also been compared to Walter Matthau, another inspiration for the character's design, by LA Weekly editor Scott Foundas, suggesting that actor Ed Asner was channeling him while performing the role of Carl.Variety editor Todd McCarthy described Carl as a combination of both Tracy and Matthau. The relationship between Carl and his wife Ellie has been praised in several media outlets. In his book Disney, Pixar, and the Hidden Message of Children's Films, author M. Keith Booker described the love between Carl and Ellie as touching. While also describing the scene of the two of them aging as a "masterpiece of its own kind," he was not sure how much children would appreciate the scene, commenting that his son was squirming in his seat during the scene. Reelviews editor James Berardinelli praised their relationship, stating that it brought a tear to his eye in a way no animated film has done, including anything by famed anime director Hayao Miyazaki. Ann Hornaday praised the prologue, describing it as "worthy of Chaplin in its heartbreaking poignancy." Chicago Tribune editor Michael Phillips praised the scene, describing it as an emotional and cinematic powerhouse, and that he also was nearly moved to tears. However, Salon editor Stephanie Zacharek criticized the love between Carl and Ellie, describing their marriage as resembling a dental adhesive commercial more than a real relationship. Edward Asner was praised in several media outlets for his portrayal of Carl. San Francisco Chronicle editor Mick LaSalle praised Asner as a great choice due to having a grumpiness to his voice that is not truly grumpy, but rather coming from a protective stance. Entertainment Weekly editor Lisa Schwarzbaum praised Asner's acting, stating that he has a "Lou Grant authority" to his voice.Time editor Richard Corliss stated that Asner had the "gruffness and deadpan comic timing to bring Carl to life." The Boston Globe editor Ty Burr concurred with this, stating that his Lou Grant-like voice had not diminished with time. USA Today editor Claudia Puig praised Asner's delivery, describing it as superb. The formulation of Russell as an Asian-American character, along with the casting of an Asian-American in the role was met positively as well. Both Nagai and the film were awarded by the East West Players for the depiction of Russell. EWP lauded Pixar for the creation of the character, stating, "We are proud to honor a very progressive film company like Pixar who cast an Asian-American character alongside an elderly one to play the leads in a feature film." The character is noted as Pixar's first lead Asian character, and was further positively received within the added context of historical non-Asian castings for Asian roles in entertainment. Asian-American organizations and entertainment websites, such as media watchdog Media Action Network for Asian Americans (MANAA), Racebending.com, and Angry Asian Man praised the character and Pixar for its diverse character depictions, noting the general lack of Asian-American lead characters and Asian actors cast in entertainment. In an interview with NPR in 2013, Angry Asian Man's Phil Yu reflected on the character's lack of typical Asian stereotyping, stating, "You know, he just happens to be Asian and he's, you know, really adorable character. But that kid could've been of any ethnicity but they made the effort to make him Asian—just a little color, you know, and it's really wonderful when that kind of thing happens where they don't have to play that up and make it like a thing or a joke, which happens a lot." Up won two awards at the 82nd Academy Awards, for Best Animated Feature and Best Original Score. It is the second of three animated features to have been nominated for the Academy Award for Best Picture. Beauty and the Beast and Toy Story 3 were also nominated for Best Picture in their respective years. Up also won Best Original Score and Best Animated Feature Film at the 67th Golden Globe Awards. It was nominated for nine Annie Awards in eight categories, winning two awards for "Best Animated Feature" and "Best Directing in a Feature Production". Up also received the Golden Tomato from Rotten Tomatoes for highest-rating feature in 2009, and best reviewed animated film, with an approval of 98 percent from film critics, based on 259 reviews. At the 2010 Kids' Choice Awards the film won Favorite Animated Movie. Jordan Nagai was awarded the Breakout Performance Award at the 44th East West Players 44th Anniversary Visionary Awards and Silent Auction for his role as Russell by the East West Players. The organization also awarded the film with the EWP Visionary Award for its progressive casting of an Asian-American lead. Dug, the talking canine, was awarded the Palm Dog Award by the British film critics as the best canine performance at Cannes Film Festival, winning over the fox from Antichrist and the black poodle from Inglourious Basterds. On May 26, 2009, a video game by the same name themed around the movie was released for multiple platforms. A video game, Kinect Rush: A Disney–Pixar Adventure, was also released on March 20, 2012, for the Xbox 360. It features characters from five of Pixar's films: Up, The Incredibles, Cars, Ratatouille, and Toy Story. ^ a b c "Up (2009)". Box Office Mojo. Amazon.com. Retrieved August 20, 2016. ^ a b c Barnes, Brooks (April 5, 2009). "Pixar's Art Leaves Profit Watchers Edgy". The New York Times. Retrieved April 6, 2009. ^ Greydanus, Steven D. "Up (2009) | Decent Films - SDG Reviews". Decent Films. Retrieved August 22, 2016. ^ Wloszczyna, Susan (May 21, 2009). "Pixar moves on 'Up' with its 10th movie". USA Today. Retrieved November 22, 2013. ^ Horn, John (March 19, 2009). "Pixar's 'Up' to open Cannes Film Festival". Los Angeles Times. Retrieved November 22, 2013. ^ Hazlett, Courtney (February 2, 2010). "Things looking 'Up' for best picture race". Today.com. Retrieved November 22, 2013. ^ Horn, John (June 7, 2009). "A heartfelt film within a film in 'Up'". Los Angeles Times. Retrieved August 10, 2015. ^ a b "Video Interview: Up Director Pete Docter and Producer Jonas Rivera". /Film. February 13, 2009. Archived from the original on December 9, 2012. Retrieved February 14, 2009. ^ a b c d Keast, James (February 6, 2009). "Pixar Reveals Early Look At Up". Exclaim!. Retrieved November 22, 2013. ^ a b c d Corliss, Richard (May 28, 2009). "Up, Up and Away: Another New High for Pixar". Time. Retrieved November 22, 2013. ^ "¿A quién se parece?" [Who does he look like?]. Revista Semana (in Spanish). May 23, 2009. Retrieved June 14, 2009. ^ a b c d e f g h i "Production notes". Official site. Retrieved May 13, 2009. ^ a b c d e "News Etc". Empire. February 2009. pp. 12–15. ^ "Comic-Con DISNEY/PIXAR Panel: UP". UGO Networks. July 25, 2008. Archived from the original on August 1, 2008. Retrieved July 28, 2008. ^ King, Susan (May 28, 2009). "Jordan Nagai, 'Up'". Los Angeles Times. Retrieved November 22, 2013. ^ a b c d Lee, Patrick (March 2, 2009). "Up director Peter Docter on talking dogs, youth scouts and adventure". Sci Fi Wire. Archived from the original on March 23, 2009. ^ a b c d e f g "Up Producer/Director". Moviehole. February 12, 2009. Retrieved February 12, 2009. ^ Wloszczyna, Susan (May 21, 2005). "Pixar moves on 'Up' with its 10th movie". USA Today. Retrieved November 22, 2013. As for Up, Pixar's 10th outing, which opens May 29, about a cranky codger and an overeager Asian kid who fly off to South America in a house hoisted by helium balloons, it will likely be the first film that all three—father, mother and child, who turns 2 today—enjoy together. ^ a b "Jordan Nagai as Russell in UP". Channel APA. May 29, 2009. Archived from the original on November 10, 2012. Retrieved June 1, 2017. ^ a b c Horn, John (May 10, 2009). "'Up' is Pixar at its most ambitious". Los Angeles Times. Retrieved May 10, 2009. ^ "Easter Eggs in Pixar's UP". SlashFilm. June 1, 2009. Archived from the original on January 4, 2013. Retrieved June 1, 2009. ^ a b Liu, Ed (February 8, 2009). "NYCC 2009: Spending Time with Disney/Pixar's "Up" (and, Disney's "Surrogates")". Toon Zone. Retrieved February 8, 2009. ^ "PETE DOCTER - In Conversation With... - TIFF 2015". TIFF Originals. June 19, 2015 – via YouTube. ^ Catmull, Ed; Wallace, Amy (April 8, 2014). Creativity, Inc.: Overcoming the Unseen Forces That Stand in the Way of True Inspiration. Random House. pp. 148–50. ISBN 978-0812993011. ^ a b c d e f Desowitz, Bill (July 29, 2008). "Pete Docter Goes Up". Animation World Network. Retrieved January 1, 2009. ^ "Q&A: Pete Docter". The Hollywood Reporter. May 12, 2009. Retrieved October 1, 2015. ^ "Quint chats with Pixar's Pete Docter and Jonas Rivera about UP! Plus a McCameo!". Ain't It Cool News. March 28, 2009. Retrieved November 22, 2013. ^ "Interview: Pete Doctor on Disney/Pixar's UP". Major Spoilers. November 8, 2009. Archived from the original on February 8, 2010. Retrieved August 2, 2011. ^ Katey Rich (February 8, 2009). "NYCC: Interview With Pete Docter And Jonas Rivera". Cinema Blend. Retrieved February 9, 2009. ^ Barbara Robertson (May – June 2009). "Pixar's Up; The new animated film is brimming with dogs". Archived from the original on February 4, 2013. Retrieved July 2, 2012. ^ Adler, Shawn (August 7, 2008). "'Up' And Coming: 3-D Pixar Movie Tells A 'Coming Of Old Age' Story, Director Says". MTV. Retrieved January 13, 2009. ^ a b Desowitz, Bill (February 11, 2009). "Docter Goes Halfway Up". Animation World Network. Archived from the original on February 18, 2009. Retrieved February 14, 2009. ^ Davis, Erik (February 7, 2009). "Cinematical Previews Pixar's 'Up'". Cinematical. Retrieved February 7, 2009. ^ "Mr. Beaks Goes UP with Pixar's Pete Docter!". Ain't It Cool News. July 27, 2008. Retrieved January 1, 2009. ^ Gibron, Bill (November 10, 2009). "Adventure is "Up" There: A Talk with Pixar's Pete Docter and Bob Peterson". PopMatters. Retrieved August 2, 2011. ^ "Pixar convirtió la Gran Sabana venezolana en el escenario de su nueva película animada UP". elzuliaunido. April 10, 2009 – via YouTube. ^ "Exclusive! First Look at 12 Big Movies Coming In 2009". Entertainment Weekly. Retrieved January 1, 2009. ^ Edelstein, David (May 24, 2009). "Multidimensional". New York. In search of a merit badge for assisting the elderly, Russell (voiced by Jordan Nagai), a roly-poly Asian-American wilderness explorer, gets caught on the porch when the house lifts off, then irritates the old man with his chatter. ^ "Peter Docter". ReelzChannel. May 27, 2009. Archived from the original on October 13, 2008. Retrieved August 2, 2011. ^ Douglas, Edward (February 6, 2009). "A Sneak Preview of Pixar's Up". ComingSoon.net. Retrieved February 7, 2009. ^ Busch, Jenna (February 12, 2009). "Up footage and Q&A!". JoBlo.com. Archived from the original on February 13, 2009. Retrieved February 14, 2009. ^ O'Brien, Jon. "Up [Original Score]". Allmusic. Rovi Corporation. Retrieved February 14, 2011. ^ "Nominees & Winners for the 82nd Academy Awards". Academy of Motion Picture Arts and Sciences. Archived from the original on April 19, 2010. Retrieved August 20, 2011. ^ "Nominees". Grammy Awards. National Academy of Recording Arts and Sciences. Retrieved August 20, 2011. ^ "Golden Globes 2010 winners: 'Avatar' wins best picture, drama". Entertainment Weekly. January 17, 2010. Retrieved August 20, 2011. ^ "BAFTA Winners 2010". British Academy Film Awards. British Academy of Film and Television Arts. January 21, 2010. Archived from the original on April 5, 2012. Retrieved August 20, 2011. ^ "Up at Disney's El Capitan Theatre in Hollywood w/ New Stage Show". Pixar Planet. April 22, 2009. Retrieved April 23, 2009. ^ Ronnie del Carmen (March 15, 2009). "UP: My name is Dug". Ronnie del Carmen. Archived from the original on March 23, 2009. Retrieved March 16, 2009. ^ "Aflac Announces New Integrated Marketing Campaign" (Press release). Aflac. April 22, 2009. Archived from the original on June 4, 2009. Retrieved April 23, 2009. ^ "Aflac's Partnership with Up: NASCAR/TV Commercial". Pixar Planet. May 7, 2009. Retrieved May 7, 2009. ^ "Up Two For One: Blimp Goes Up + New Up Still". Pixar Planet. May 7, 2009. Retrieved May 9, 2009. ^ "Up Cluster Balloon Tour". Pixar Planet. April 23, 2009. Retrieved April 25, 2009. ^ "Pixar grants girl's dying wish to see 'Up'". ocregister. June 18, 2009. Retrieved February 1, 2015. ^ Moring, Mark (May 26, 2009). "What's Up, Doc(ter)?". Christianity Today. Retrieved August 2, 2011. ^ Yelhsa (March 15, 2009). "Pixar UPisodes". Teaser Trailer. Retrieved August 9, 2012. ^ McLean, Thomas J. (August 10, 2009). "Up Comes Home; Monsters, Inc. Gets Blu-ray Upgrade". Animation Magazine. Retrieved September 3, 2011. ^ Das, Lina (February 5, 2010). "From Dug the Dog to Pizza Planet, have you picked up on Pixar's in-jokes?". Daily Mail. Retrieved September 3, 2011. ^ Sciretta, Peter (August 24, 2009). "Cool Stuff: Pixar's Up Luxo Jr. Limited Edition Collector's Set". /Film. Archived from the original on September 10, 2012. Retrieved August 2, 2011. ^ Josh Cooley. "George & A.J." Pixar. Archived from the original (video) on June 21, 2010. Retrieved January 31, 2010. ^ "Pixar Short: George and AJ". YouTube. November 20, 2009. Retrieved August 2, 2011. ^ "Up – DVD Sales". The Numbers. Retrieved July 5, 2010. ^ "Top-Selling DVDs of 2009". The Numbers. Retrieved April 26, 2010. ^ Sciacca, John. "Want to rent 'Up?' No closed captions for you! | Sound and Vision Magazine". Soundandvisionmag.com. Retrieved February 1, 2012. ^ Anna on (November 18, 2009). "Dear Disney & Pixar: Closed Captioning and Audio Descriptions are not "special features"". Disabledfeminists.com. Retrieved February 1, 2012. ^ Northrup, Laura (November 22, 2009). "Disney Claims "Up" DVD Missing Captions Were A Mistake". The Consumerist. Archived from the original on January 25, 2010. Retrieved February 1, 2012. ^ "2009 WORLDWIDE GROSSES". Boxofficemojo.com. Retrieved August 9, 2012. ^ a b c "Pixar". Boxofficemojo.com. Retrieved August 9, 2012. ^ "Buena Vista All Time Box Office Results". Boxofficemojo.com. ^ "3D Movies at the Box Office". Boxofficemojo.com. Retrieved August 9, 2012. ^ "Animation". Boxofficemojo.com. Retrieved August 9, 2012. ^ "2009 DOMESTIC GROSSES". Boxofficemojo.com. Retrieved August 9, 2012. ^ O'Brien, Bob (June 1, 2009). "Yup, 'Up': Pixar's Latest Release Lifts Disney". Barrons. Retrieved April 17, 2010. ^ "Pixar Movies Opening Weekends". Boxofficemojo.com. Retrieved August 9, 2012. ^ Gray, Brandon (December 21, 2009). "Weekend Report: 'Avatar' Soars in Debut". Box Office Mojo. Retrieved June 27, 2012. ^ Gray, Brandon (June 1, 2009). "Weekend Report: 'Up' Lifts Pixar to Tenth Smash". Box Office Mojo. Retrieved June 27, 2012. ^ "Weekend Estimates: Up Conquers Impressive Hangover". The Numbers. June 7, 2009. Retrieved June 7, 2009. ^ McClintock, Pamela (June 8, 2009). "'Hangover' Upsets 'Up'". Variety. Retrieved June 8, 2009. ^ "All Time Worldwide Box Office Grosses". Boxofficemojo.com. Retrieved August 9, 2012. ^ "2009 Overseas Total Yearly Box Office Results". Boxofficemojo.com. ^ "Overseas Total Box Office Index for 2009". Boxofficemojo.com. Retrieved August 9, 2012. ^ "Up (2009) - International Box Office Results - Box Office Mojo". Boxofficemojo.com. ^ "2009 Spain Yearly Box Office Results". Retrieved October 1, 2014. ^ "2009 Australia Yearly Box Office Results". Retrieved October 1, 2014. ^ "2009 South Korea Yearly Box Office Results". Retrieved October 1, 2014. ^ "Up". Rotten Tomatoes. Retrieved November 12, 2018. ^ "Up". Metacritic. Retrieved September 3, 2011. ^ Pamela McClintock, Emily Blank (August 12, 2011). "15 Movies That Made The Grade: A+ CinemaScore Posse". The Hollywood Reporter. Archived from the original on June 27, 2012. Retrieved June 27, 2012. ^ Ebert, Roger (May 27, 2009). "Up". Chicago Sun-Times. Retrieved December 13, 2009. ^ Ebert, Roger (May 11, 2009). "Cannes #1: Up, up and away, in my beautiful, my beautiful balloon". Chicago Sun-Times. Archived from the original on August 9, 2011. Retrieved August 2, 2011. ^ Rechtshaffen, Michael (May 12, 2009). "Up – Film Review". The Hollywood Reporter. Archived from the original on March 15, 2012. Retrieved December 13, 2009. ^ LaSalle, Mick (May 29, 2009). "Review: 'Up' soars on flights of fancy". San Francisco Chronicle. Retrieved December 13, 2009. ^ a b McCarthy, Todd (May 12, 2009). "Up Movie Review". Variety. Retrieved August 2, 2011. ^ Taylor, Kate (May 28, 2009). "Forget the goofy glasses. This magic transcends technology". The Globe and Mail. Retrieved May 16, 2011. ^ Bill Capodagli, Lynn Jackson (2009). Innovate the Pixar Way: Business Lessons from the World's Most Creative Corporate Playground. McGraw-Hill Professional. ISBN 0071664378. ^ Morgenstern, Joe (May 14, 2009). "Reaching for the Sky, 'Up' Fails to Soar". The Wall Street Journal. ^ a b Hornaday, Ann (May 29, 2009). "Up". The Washington Post. Retrieved August 2, 2011. ^ Freer, Ian. "Empire's Up Movie Review". Empire. Archived from the original on December 3, 2013. Retrieved August 28, 2010. ^ a b Schwarzbaum, Lisa (May 27, 2009). "Movie Review: Up (2009)". Entertainment Weekly. Retrieved August 2, 2011. ^ Corliss, Richard (May 28, 2009). "Up, Up and Away: Another New High for Pixar". Time. Retrieved August 2, 2011. ^ Foundas, Scott (May 28, 2009). "Movie Reviews: Burma VJ, Up, What Goes Up". LA Weekly. Retrieved August 2, 2011. ^ Booker, M. Keith (2010). Disney, Pixar, and the Hidden Message of Children's Films. ABC-CLIO. ISBN 0313376727. ^ Berardinelli, James (May 26, 2009). "Reelviews Movie Reviews". Reelviews. Retrieved August 2, 2011. ^ Zacharek, Stephanie (May 29, 2009). "Up". Salon. Retrieved October 10, 2012. ^ LaSalle, Mick (May 29, 2009). "Review: 'Up' soars on flights of fancy". The San Francisco Chronicle. Retrieved August 2, 2011. ^ Burr, Ty (May 29, 2009). "Up". Boston Globe. Retrieved August 2, 2011. ^ Puig, Claudia (May 28, 2009). "Balloon-propelled 'Up' soars with delight, great visuals". USA Today. Retrieved August 2, 2011. ^ a b c d "EWP Honors Pixar Films And Jordan Nagai At 44th Anniversary Visionary Awards 4/19". BroadwayWorld.com. April 20, 2010. Retrieved September 16, 2013. ^ a b Hu, Alex (May 28, 2009). "Asians in Movie 'Up' and Others". AsianWeek.com. Archived from the original on September 23, 2013. Retrieved September 16, 2013. ^ "ASIAN AMERICAN MEDIA WATCHDOG GROUP PRAISES DISNEY/PIXAR'S "UP" FOR CREATING ASIAN AMERICAN PROTAGONIST". MANAA.org. June 2, 2009. Archived from the original on September 2, 2009. Retrieved September 16, 2013. ^ Yu, Phil (November 10, 2009). "OUT ON DVD: PIXAR'S UP". blog.angryasianman.com. Retrieved September 16, 2013. ^ Martin, Michel (September 9, 2013). "Angry Asian Man Not So Angry". NPR. Retrieved September 16, 2013. ^ "Golden Globes 2010 winners: 'Avatar' wins best picture, drama". Entertainment Weekly. January 17, 2010. Retrieved August 10, 2010. ^ "37th Annual Annie Nominations and Awards Recipients". AnnieAwards.org. Archived from the original on December 4, 2009. Retrieved February 7, 2010. ^ "Kids' Choice Awards Winners 2010". Kids' Choice Awards. Archived from the original on March 23, 2010. Retrieved August 11, 2010. ^ "Pixar pooch picks Up Cannes prize". BBC News. May 22, 2009. Retrieved August 28, 2010. Wikimedia Commons has media related to Up (2009 film).